Horses are the foundation of our work and essential to our success. We seek good mannered, sound, safe and well-cared for horses. Our herd is a mix of breeds, ages and backgrounds. When possible, we work with horses that might otherwise be jobless or in need of a new career. Every horse is retrained by our staff before becoming part of our Therapeutic, EAL or horsemanship programs. Star Pony is happiest chilling out and eating grass. She is swift footed and quite agile for a draft pony, but doesn't share her fancy moves easily. She's laid back, yet will work for compliments and rewards. Her flowing mane and feathered feet are part of her breed attributes as a Dales Pony. Star Pony has a warm nurturing side and gifted two foals in years past. Shayna, the beautiful one, is sweet and curious. She likes to stick her nose into everything, loves attention and is not easily rattled. Although she ran free with a wild herd of mustangs a short time ago, she is quiet, slow, and teaches others the value of trust. Shayna is a close buddy of Remy and Simba and she can run just as fast as a race horse. Remy is the clown of the herd and is frequently causing mischief. He is playful, curious, and brave. He used to be a winning race horse with a competitive streak. These days, Remy is having fun enjoying his more mellow life at the Horse Center and can often be found chilling out in the pasture with his herd. Simba is a sweet and sensitive guy. He’s great with kids and, while mostly laid back, he also likes to work hard on his retraining of the basics of horsemanship. He’s a gorgeous horse with his big white blaze and three white socks. Simba is another winning racehorse but really prefers going on trail rides with Remy and Shayna better than anything else. We had a renaming party for Hero (aka Rebel) because he is such a HERO! He loves attention but even more so he loves having a job. Whether it be learning more about ground manners or practicing balanced trot transitions he stays right with you and works hard to figure out exactly what you are asking for. In his next life, he'd really like to come back as a majestic unicorn! Callie is kind, gentle and very refined. This sweet girl loves to spend time with kids and enjoys getting lots of attention. She is a hard worker and active in all of the programs at the Horse Center. Jasmine is a sassy chestnut mare with lots of personality. She is sweet with people and a little bossy with other horses. Her part arab breeding gives her a very refined classy look that always gets attention. She's very good at posing for the camera! Zeb is a gentle guy who speaks his mind. He gets along with everyone and teaches us the value of patience and acceptance. He works in the EAL and horsemanship programs. Shardon has been a stoic, caring teacher for most of his 26 years. He is a gorgeous copper Dutch Arabian with flashy moves and loves to show off his float-like trot. In his younger years, Shardon was a successful dressage competitor. These days, he loves teaching kids and hanging with his best buddy, Hero. Pilgrim is a Morgan and one of the nicest horses. He's too old to ride at the ripe age of 32 and is used for grooming and tack lessons. He also helps out during the Fun and Games programs on Saturdays with the younger riders for dress-up. He can be a little stubborn and slow to get going especially when leading him in from the fields, though once he starts to walk he’ll follow you back to the barn. Deborah is 25 years old and the beloved Rising Tide horse since its inception a decade ago. She is an Australian bred Halflinger from Wadek-U-Lesa Farm in Quebec, Canada. The Halflinger breed originated in Tyrol, Austria in the 1800s from the crossing of a ½ Arab stallion and a refined Tyrollean mare. They were originally used as all-around farm horses.Today’s Halflinger has evolved into an excellent pleasure horse. They are calm, good natured, sure footed, and willing to work. Deborah demonstrates all of these qualities and more! She is deeply loved by our riders, volunteers, and staff. She is a star! Noble is approximately 26 years old. 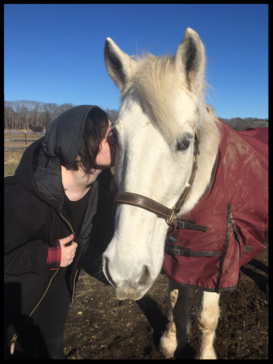 He is a gray Percheron cross -- In the horse world, white horses are technically called gray. He has a past career as a hunter jumper and a lesson horse. Noble was with Rising Tide for nine year and is now settling into his new home at the Horse Center. He’s retired from therapeutic riding, but loves a trail ride and showing off in the arena with an experienced rider. He's our ambassador of handsome-ness!